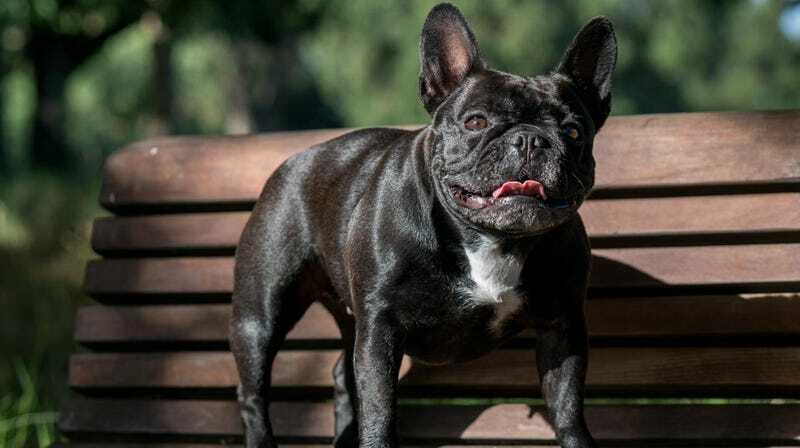 Three-year-old Moxie, one of the French bulldogs who helped UC Davis researchers discover a mutation that might explain her screw tail. One of the most distinctive body parts of your typical English bulldog, French bulldog, or Boston terrier—their coiled screw tail—might be caused by a specific genetic mutation, suggests recent research. And more importantly for us humans, that same genetic quirk might help scientists better understand a rare disorder in people. Bulldogs and terriers are some of the many breeds known for their scrunched-up, wide heads (formally known as brachycephalic breeds). Cute as this feature might be, though, it actually raises a dog’s risk of serious health problems. For instance, the flattened skulls can restrict their oxygen flow, making them more likely to have breathing or heart issues, and their often bulged-out eyes can be prone to injury. But bulldogs and terriers are even worse off, since most are born with deformed spines. The literal end result of this trait is the shortened screw tail they carry around. This English bulldog has the distinctive screw tail. The researchers behind the current study, published last month in PLOS Genetics, wanted to get a closer look at the genetic differences underlying different breeds, particularly screw-tailed dogs. So they sequenced the complete DNA of 100 dogs across 21 breeds, 10 of which had screw tails. Their analysis, according to the researchers, was different than past efforts to study genetic differences in dogs, since they compared all of the genetic variations present in these dogs to one another at once. The dogs were recruited from pet owners who sought care at the UC Davis Veterinary Medical Teaching Hospital. The group included other brachycephalic but rarely screw-tailed breeds, like the pug, as well as several English bulldogs, French bulldogs, and Boston terriers. Bannasch and her team spotted a specific mutation, in a gene known as DISHEVELLED 2 or DVL2, in all of the bulldogs and Frenchies and in nearly every terrier (94 percent). But the mutation couldn’t be spotted in any other dog, short-faced or not. The mutation, they also found, seems to alter a protein that helps cells communicate with one another during a dog’s development in the womb. That subtle change might then account for the misshapen spines seen in these poor dogs. That’s interesting enough as it is. But the kind of health problems and skeletal deformities seen in bulldogs and terriers are very similar to those found in people who suffer from a debilitating genetic disorder called Robinow syndrome. And sure enough, Bannasch and her team found that the DVL2 mutation they spotted in these dogs is very much like the mutations in the human DVL1 and DVL3 genes that cause Robinow syndrome in people. Scientists currently use specially bred mice as a model to study Robinow syndrome, an incredibly rare condition with fewer than 200 documented cases. But given how common this mutation is in certain breeds, dogs could be an ideal model animal for further research. Dogs are already commonly used to study rare genetic disorders in people, including to test out experimental treatments like CRISPR. As for the screw-tailed dogs themselves, the researchers say there’s still a lot to uncover about them. Even if this one mutation can explain their spines, it likely doesn’t affect all the breeds to the same degree or in the exact way. And there are probably many more genes and complex interactions between them that will explain why short-faced dogs are short-faced. That research, it’s hoped, might better help us find ways to breed healthier dogs.